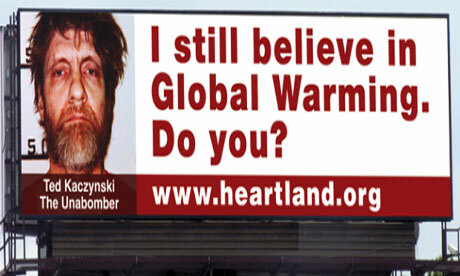 As I understand it, the group's message is that only kooks believe in global warming. I don't know about that, but another subject I do know something makes me wonder about the quality of scientific analysis coming from the organization. A decade after the treatment had been discredited as useless and potentially deadly in a report published by the National Academy of Sciences, the Heartland Institute's medical policy advisor was hyping the use of the Heimlich maneuver for drowning rescue. Drowning is choking on water. - It causes water to gush suddenly out of the drowning victim’s mouth, and breathing begins again. - It is the only way to remove water from lungs - and you cannot force air into water-filled lungs. - It works fast. Doing four maneuvers in only 10 seconds causes water to gush out. Undoubtedly Meier got these cartoon ideas from another institute with an agenda, Cincinnati's Heimlich Institute, which promotes my father's crackpot medical claims and arranges notorious, bizarre "research" like infecting Chinese AIDS patients with malaria. Incidentally, that story was widely reported almost a year before Meier's article. According to Heartland's website, Meier (who died in 2005) was an insurance executive who apparently had no medical training. In a tribute to his late friend and colleague, Heartland's president and CEO Joseph Bast called Meier his "mentor on health care issues." Meier may have been a nice guy, but as for his research skills, I doubt even Ted Kaczynski would consider the Heimlich Institute a credible source of medical information. Finally, if you're interested in a non-fiction article about the Heimlich for drowning rescue, see Deadly Maneuver by Kendra Kozen in this month's Aquatics International magazine.